This Wednesday, September 12, the North American Interfraternity Conference is asking all fraternity men to tweet, using the hashtag #myFraternity, about the impact of their fraternity experience. The goal, as I see it, is to fill the twitter-verse and beyond with positive reflections of an institution that often faces disparagement. #myFraternity taught me that being a fraternity man is not easy. But nothing in life that's worthwhile ever is. #myFraternity provided me with countless real-life leadership lessons and experiences. 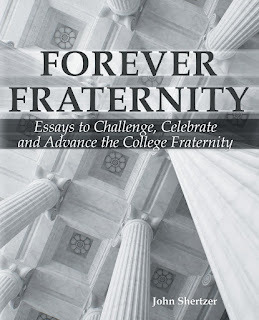 #myFraternity was the best way to live my college years. #myFraternity occupied a house that was often a pit, and made my mother cry whenever she left me there and drove away. But it was home. And when I drove away the last time, I may have cried too. #myFraternity didn’t shy away from shenanigans. And I’m smiling big right now thinking about one in particular. #myFraternity has a very compelling Ritual. Which is better than a beautiful one. Because I still think about it. #myFraternity looked out for each other. My brothers were a constant and daily force in my life back then, and still are today. #myFraternity wasn’t just a club. It was an education. #myFraternity taught me the difference between the big things that matter and the little things that don’t. I appreciate how self-governed #myFraternity was. Sure, we made plenty of mistakes, but we lived to tell the tale. I love #myFraternity because we basically looked the opposite of those posed, well-coiffed, smiles and shoulder-grabbing stock-photo pictures of fraternity men. #myFraternity showcased how tough and relentless men can be when they go at each other, and yet how accepting and forgiving they can be when they come back together. #myFraternity gave me a set of ideals and values to hold up against my actions and decisions. It's a timeless roadmap. #myFraternity was a gift to my life. Not a gift that ends up in a drawer or on a shelf...but rather a gift that is always displayed, cared for, and treated as though it's as precious as any possession could be. #myFraternity led me to a career in higher education, which led me to pursue a graduate degree, which led me to meet a sorority woman who was on the same path, and she became my soul mate, and my wife. #myFraternity made me laugh. At least twice as much as it made me mad. That’s a good ratio if ever you can find it. #myFraternity opened my eyes to all the dedicated professionals devoted to #myFraternity experience. Thank you. The last place I stood on campus before I walked to the graduation ceremony was #myFraternity house. #myFraternity stays with me as I journey through life. I will forever be thankful for #myFraternity. Join in and follow the hashtag #myFraternity on September 12. I encourage you to avoid the glossy brochure-speak and be real and authentic in what fraternity has given you.